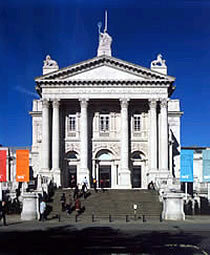 The Tate Britain was opened in 1897, the first of a network or Tate galleries, by Henry Tate who made much of his money from sugar. Today, it houses collections of British artwork from 1500 to the present day. However, much of its modern artworks have been moved to the Tate Modern. The Clore Galleries are dedicated to the 300 oil paintings and 20,000 watercolours by JMW Turner, which were left to the nation when he died. However, not all are on display at one time.